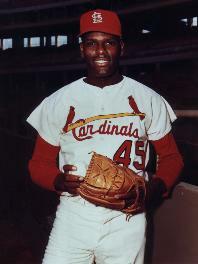 Bob Gibson is a native of Omaha, Nebraska. Five times a 20-game winner, his 3,117 strikeouts made him only the second pitcher to reach 3,000. First to fan 200 or more in a season 9 times, set National League mark with 1.12 ERA in 1968. Hurling 13 shutouts twice, world series MVP, setting records for consecutive victories (7), consecutive complete games (8), and a series (35). 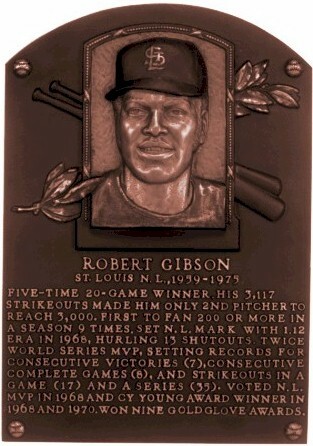 Voted National League MVP in 1968 and Cy Young award winner in 1968 and 1970. Won 9 Gold Glove awards. Elected to Hall of Fame in 1981.